Tanzania Tourist Board launches its first ever international tourism fair, the Swahili International Tourism Expo (S!TE). The four-day tourism expo will be held in in Dar es Salaam, Tanzania�s commercial capital located along the coastline of Tanzania, East Africa from October 1 � 4, 2014 at the Mlimani City Conference Centre. The Swahili International Tourism Expo will focus on inbound and outbound travel to Africa and is expected to draw hundreds of tourism and travel professionals from all over the world. The Expo will take the format of a travel and trade exhibition with a conference element focusing on topical tourism, sustainability, conservation and other market related issues. In the bid to promote tourism in Tanzania, the Tanzania Tourist Board (TTB) partnered with Pure Grit Project and Exhibition Management Ltd., South Africa, the exhibition and events management company that put INDABA on the world travel industry calendar of events. The tourism expo derived from the word "Swahili" which is an Arab word, meaning �boundary" or "coast" and ultimately it came to be applied to the people living on the East Africa coast and their language. Tanzania, the largest country in East Africa, is focused on wildlife conservation and sustainable tourism, with approximately 28% of the land protected by the Government, the largest percentage of any country in the world. It boasts 16 National Parks and 31 game reserves, 50 Game Controlled Areas, one special Conservation Area (the Ngorongoro) and three Marine Parks. It is home to the tallest mountain in Africa, the legendary Mt. Kilimanjaro; The Serengeti, home to the "Great Animal Migration" that was named the New 7th Wonder of the World by USA Today and ABC TV's Good Morning America; the world acclaimed Ngorongoro Crater, often referred to as the "Eden of Africa" and the �8th Wonder of the World�; Olduvai Gorge, the cradle of mankind: the Selous, the world�s largest game reserve; Ruaha, now the second largest National Park in Africa; the spice islands of Zanzibar; and seven UNESCO World Heritage Sites. Most important for visitors, the Tanzanian people, with a rich history and diverse blend of cultures, are warm and friendly. On December 9, 2011, Tanzania, an oasis of peace and stability with a democratically elected and stable government, celebrated its 50th Anniversary of Independence. 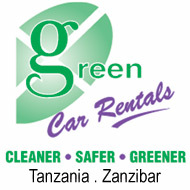 For more information on Tanzania, visit www.tanzaniatourism.go.tz. Kilimanjaro Kempinski Hotel: Tanzania tourism is booming and this is reflected in new hotel investments by well known luxury brand hotels such as Kempinski, Movenpick and Sun International. For the first two, Kempinski and Movenpick, Tanzania represents their first venture in East Africa. "These major hotel projects, both on mainland Tanzania and Zanzibar, demonstrate great confidence in the future of the country's tourism growth," said Hon. Zakia Hamdani Meghji, MP, Tanzania's Minister for Natural Resources and Tourism. According to Peter Mwenguo, Managing Director, Tanzania Tourist Board (TTB), "the five- star 180 room Kilimanjaro Kempinski Hotel opening promises to revive Dar es Salaam as a major port of call and tourism center. This major investment in down-town Dar es Salaam will play a key role in upgrading the surrounding waterfront area. In addition, the hotel will serve as an anchor for the development of Tanzania's "Southern Wildlife Circuit. Mövenpick: Mövenpick Hotels & Resorts has signed a management agreement to operate the 251 room Mövenpick Royal Palm Hotel Dar es Salaam. Amenities include a fitness centre with sauna, an outdoor pool, a hair and beauty salon, plus tennis, squash and golf facilities nearby. The comprehensive range of conference and banquet facilities which can cater up to 440 participants and the lavishly furnished Business Centre provide business executives with the ideal conditions to stage successful meetings and events. Henry Pelham Burn, New York based author and bookbinder, on a recent visit to Tanzania, was surprised to find that Dar es Salaam, often seen as a place to pass through on the way to a safari or Zanzibar, is in itself, a fascinating part of one's visit to Tanzania. These are some of his Dar es Salaam "finds." For a complete contrast, the NATIONAL MUSEUM downtown breathes an air of genteel neglect. You may be the sole visitor. The fossil discoveries from Olduvai Gorge are impressively displayed downstairs. Upstairs, the years of colonialism and the anti-colonial struggle are presented through a historically fascinating mishmash of objects, photos and yellowing documents. A poignant sculpture tribute to the twelve Tanzanians who died in the attack on the US Embassy is in the garden. Next to the Royal Palm Hotel is the NYUMBA YA SANAA or Nyerere Cultural Centre. In this tranquil setting built around an open-air pond you can browse undisturbed among samples of local arts and crafts - handmade paper, batik, paintings, jewelry, even shoes - all for sale, or just sit over a soda or lunch. I passed up a fishskin suit for the beautifully blue-dyed skin of a three-foot Nile Perch ($5) that as a bookbinder I intend to use in my work. From the main post office for 15 cents you can catch a small bus (or dalla-dalla) all the way out to MWENGE VILLAGE, almost to the University. Or, for $5, you can take a cab. I must confess to the cab, mainly because the buses filled up so fast I could never get a seat. Mwenge Village is the site of a score or more stalls selling carvings, jewelry, exotic cloth and trinkets of all kinds at bargain (as long as you do!) prices. This is where dealers from Nairobi come to buy. In the very end stall I found a striking Nyakusa wall-hanging of tightly woven raffia in a geometric pattern of contrasting browns, the smell of wood smoke still clinging to it, ($15). In the shade of some trees sat a line of wood carvers, chipping, gouging, filing and sanding. The man I squatted down next to was of the Makonde tribe from Mozambique, he told me. The intricate design he was sculpting from a block of ebony would take him about two months to finish, he calculated, demonstrating the various stages. Also in the Mwenge direction, right off the busy New Bagamoyo Road, is the VILLAGE MUSEUM. The cab driver who dropped me off agreed to come back in an hour. I wish I'd made it two. I had to tear myself away from some very energetic tribal dancing that takes place here most afternoons and of which I was the sole spectator. 'Museum' is a bit misleading. People came from all parts of the country to build houses typical of their tribe in this park setting. With a flashlight (bring your own, theirs are very weak) and the help of explanatory labels I wandered in and out of some ten dwellings (there were many more) noting the details of daily life and the intricacies of construction. There was a garden planted with indigenous crops and, in one corner, artists painting in the colorful tinga-tinga style had set up shop. They tutored me in the laid-back Swahili greeting, "Mambo?" (things), to which the response is, "Poa!" (cool) This goes over very well. I also came across a noted potter, Petro Mayige, in his studio, and couldn't resist a set of the clay figurines he sculpts using traditional know-how: an old man trouncing a youth at a game of bao, $15. The evening of my last day in Dar I sat on the terrace of a humble restaurant on COCO BEACH with two Tanzanian friends I'd made. The beach, on Oyster Bay, had been closed for a couple of years - they explained - following the depradations of a killer shark. Now the shark had been caught and the beach was open and with plates of changu (a tasty local fish) and chips (French fries) and bottles of Kilimanjaro and Safari beer we watched the moon rise over the Indian Ocean. It was very peaceful. We were the only diners. Had I stayed another day I'd have followed my friends' advice and taken the five minute ferry-ride from Kivukoni Front (near the new Japanese-built fish market) across to the southern peninsula of Kigamboni and explored the beaches there, so close to Dar yet apparently so unspoiled, with a couple of small guest houses and bars to choose from. Showcasing the diversity of Tanzania and Zanzibar's tourist attractions at booth # 1261, the six-person Tanzania delegation to Seatrade includes Tanzania Tourist Board (TTB) of Directors, Mrs. Vicky Swai and Mrs. Scolastica Ponera; Koz Gamba, Chairman of the Tanzania Cruise Tourism Committee, Mr. James Lembeli, Tanzania National Parks (TANAPA); Mrs. Sabaah Ali, Zanzibar Tourist Corporation; Mr. Ali Haji, Zanzibar Port Corporation, and a representative from the Ngorongoro Conservation Area Authority. As the cruise ship companies look for new ports of call in different parts of the world to add value to their packages, Tanzania, the largest country in East Africa, is attracting more attention. Famous as the home of Mt. Kilimanjaro, Serengeti, Ngorongoro Crater, Tanzania promotes itself as "Authentic Africa." Africa, is attracting more attention. Famous as the home of Mt. Kilimanjaro, Serengeti, Ngorongoro Crater, Tanzania promotes itself as "Authentic Africa." Brad Ball, spokesperson for Silversea Cruises, describes the attraction of this Indian Ocean Port. "The city started out as a fishing village and is today considered the commercial capital of Tanzania. Its picturesque harbor lies along some of the world's most important sea routes. In this intriguing city, visitors find themselves surrounded by an impressive display of cultural and architectural influences dating back to the Sultanates. However, it may be the friendliness and relaxed manner of the city's inhabitants that make it a truly appealing port of call. 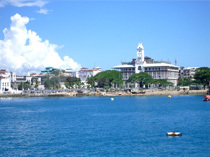 Dar es Salaam's sites of historical interest lie both in the city and the surrounding area. An organized city sightseeing tour provides a good overview for the first-time visitor. Of main interest are the game reserves and national parks, which are a good distance from Dar es Salaam and can be reached by full-day or overnight excursions."